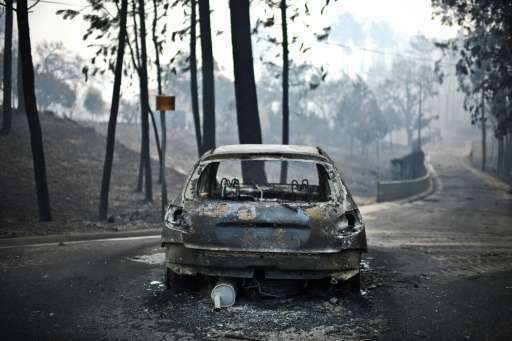 Raging forest fires in central Portugal have killed at least 62 people, many burnt to death in their cars, the government said Sunday, in the country's worst such disaster in recent history. Authorities declared three days of national mourning as more than 900 firefighters and 280 vehicles battled the blaze, which also left 62 people injured, amid scenes of devastation. 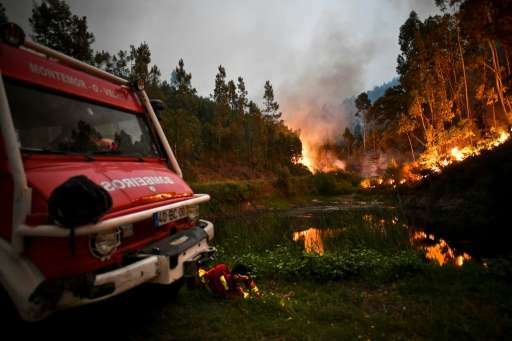 The fire erupted Saturday in the municipality of Pedrogao Grande in central Portugal, apparently caused by a lightning strike, and spread furiously in several directions. "The fire has reached a level of human tragedy that we have never seen before," said a visibly moved Prime Minister Antonio Costa, who announced three days of mourning starting on Sunday. "We will certainly find other victims on the ground" in searches from village to village, added Costa. "I am shocked and horrified by the many lives claimed by today's devastating fires," said UN Secretary General Antonio Guterres Sunday. "The United Nations stands ready to assist in any way possible," he added. 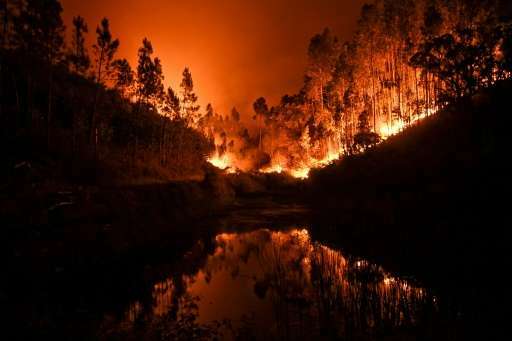 The expanse of wooded hills in the area north of Lisbon, which 24 hours before had glowed bright green with eucalyptus plants and pine trees, was gutted by the flames. A thick layer of white smoke hovered over either side of a motorway for about 20 kilometres (12 miles), as blackened trees leaned listlessly over charred soil. A burnt-out car sat outside partly destroyed and abandoned houses, while a few metres away police in face masks surrounded the corpse of a man hidden under a white sheet. Police chief Almeida Rodrigues blamed dry thunderstorms for the blaze, ruling out arson, and saying a tree had been struck by lightning. "Everything burnt very quickly given the strong winds. The flames passed within two or three kilometres of my house," said local resident Isabel Ferreira, 62. "I knew several of the victims. One of my colleagues lost her mother and her four-year-old girl as she could not get them out of the back of the car." 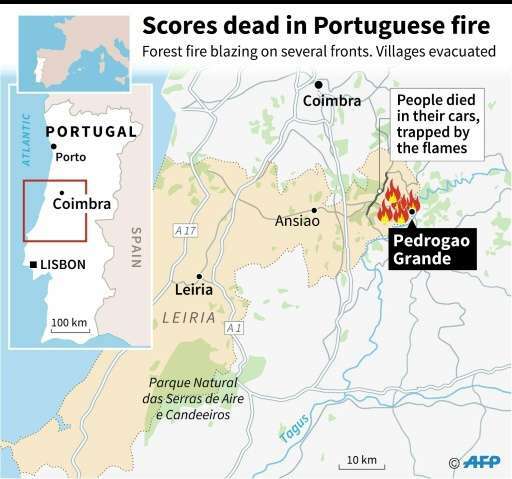 Secretary of State for the Interior Jorge Gomes said 18 of those burned to death had been trapped in their cars engulfed by flames on the road between Figueiro dos Vinhos and Castanheira de Pera. "It is difficult to say if they were fleeing the flames or were taken by surprise," he said. Other bodies were found in houses in isolated areas. At least three villages near Pedrogao Grande were evacuated. Luisilda Malheiro and her husband Eduardo Abreu, a couple of farmers, both 62, escaped the hellish route N-236. "We escaped in time, me on the tractor and he with our van," Luisilda said. "Our house is still there but we lost everything else: the chickens, the rabbits and the ducks. We were only able to save two goats," she said. Earlier Costa said the injured included five people in critical condition as well as one child and four firefighters. "The priority now is to save those people who could still be in danger," said Costa. The European Union said it would provide firefighting planes from France while Spain dispatched four water-bombing aircraft. Portugal was sweltering under a severe heatwave over the weekend, with temperatures topping 40 degrees Celsius (104 degrees Fahrenheit) in several regions. More than 140 forest fires continued to burn across the country Sunday night, with around 2,000 firefighters battling to put them out. "The fire is still raging on four fronts," Gomes said, two spreading "violently". A number of villages were affected by the main fire and homes were evacuated, their owners sheltered in neighbouring areas. Officials were not immediately able to comment on the extent of the damage. Dozens of people who fled their homes were taken in by residents of the nearby municipality of Ansiao. "There are people who arrived saying they didn't want to die in their homes, which were surrounded by flames," said Ansiao resident Ricardo Tristao. President Marcelo Rebelo went to the Leiria region to meet victims' families, saying he was "sharing their pain in the name of all the Portuguese people". Pope Francis offered his condolences in his Sunday prayers while EU Commission chief Jean-Claude Juncker hailed the bravery of the firefighters. Portugal was hit by a series of fires last year which devastated more than 100,000 hectares (1,000 square kilometres) of the mainland. Fires on the tourist island of Madeira in August killed three people, while across 2016 around 40 homes were destroyed and 5,400 hectares of land burned. In 1966, a blaze in the forest of Sintra, west of Lisbon killed 25 soldiers trying to battle the flames. Predicting tsunamis, what to measure from earthquake data? Does the angle of the magnetic field affect sunlight?